Don’t Miss Out On Our 2019 Summer Season! Year after year, Rainbow Stage produces amazing shows. Don’t miss out this year by purchasing your Season Tickets today. They make a great gift for family or friends. Call us to purchase Season Tickets or Flex Tickets (you can buy the tickets now and pick the date to attend later). Join us for Strike The Musical and our soon to be revealed Second Show, two great shows that are sure to entertain. For more information please contact us today 204. 989.0888 for all inquiries. * Exchanges can be made up to 48 hours prior to the originally purchased date for a $5.00/per ticket fee. Exchanges made less than 48 hours are subject to a $10/per ticket fee. Season Ticket Holders receive free exchanges up to 48 hours prior to performance. When you become a season ticket holder you are eligible for a discount on Guys And Dolls presented by the WSO with support from Rainbow Stage. Don’t miss one of Broadway’s longest running performances presented in a unique fashion by the WSO with support from Rainbow Stage. 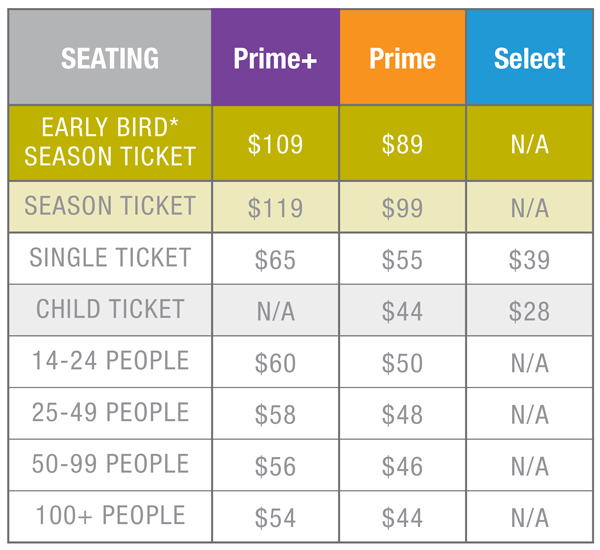 Order Early To Ensure Your Best Seats And Best Price! We accept VISA, Mastercard, debit and cash. Theatre box office opens 2 hours prior to all shows. Tickets can be mailed to a specific address for a $2.00 fee per requested envelope. Rainbow Stage is not responsible for tickets that are lost in the mail. However, lost tickets may be reprinted upon proof of purchase (ie. order reference, bank statement, credit card info). Tickets that have not been mailed or picked up will be held at the will-call window at the theatre on the night of the performance. The will call window will open 2 hours before the show starts. Please present a proof of purchase to receive your tickets. Unfortunately, tickets to the shows are non-refundable. Exchanges may be made up to 48 hours prior to the start of the original performance purchased for a $5.00 per ticket charge. If the exchange is made less than 48 hours prior to the original performance date, there will be a charge of $10.00 per ticket. All ticket exchanges must be done in person at 200-180 Market Ave. Season Ticket Holders will received free exchanges if done at least 48 prior to the original performance date. If you cannot attend any of the alternate performance dates and the tickets are not going to be used you may get a tax deductible receipt from Rainbow Stage for the ticket amount if you wish to donate the ticket cost to Rainbow Stage. This has to be done at least 48 hours before the performance. All patrons, regardless of age, must have a ticket to enter the theatre. This policy applies to everyone, including children and infants. No babes in arms permitted. When bringing children under 3 years of age to the theatre please consider whether they will be comfortable for the duration of the show. We respectfully request that all patrons bringing children to a performance consider fellow theatregoers and whether their children are of an appropriate age to appreciate the joys of live theatre. Due to union regulations, using recording devices of any kind is STRICTLY PROHIBITED. Cameras and other recording devices will be confiscated if used during a performance. Bringing outside food & beverages is strictly prohibited. For your enjoyment, concessions are open before the show starts and during intermission. Will be seated at a suitable break in the performance. The Rainbow Stage parking lot is located on the east side of the theatre. Parking attendants will guide you in and help you park as well as guide you out after the show. We allow seating for disabled and one buddy seat for a companion. We will do our best to seat the remainder of the party close to the wheelchair section as possible. If the disabled person is not in a wheelchair but has mobility issues, we suggest you sit in row 14 on either side or row 13 in the center as there are no steps to get to that area.